Hound allows users to speak naturally, and use complex sentences to find the search results they’re interested in. SoundHound has announced the public launch of its Hound app on iOS and Android. The voice search and virtual assistant app allow users to complete a variety of tasks, like placing phone calls or searching for hotels, using their voice. The app also supports follow-up questions. For instance, users can ask about today’s weather and follow that question with “How about this weekend?” to continue searching for weather data. The app utilizes the Speech-to-Meaning technology from SoundHound’s Houndify platform, which launched publicly in December 2015. While users can begin a new voice search by tapping a button within the app, they can also begin a hands-free search by saying “Ok Hound…” when the app is open. 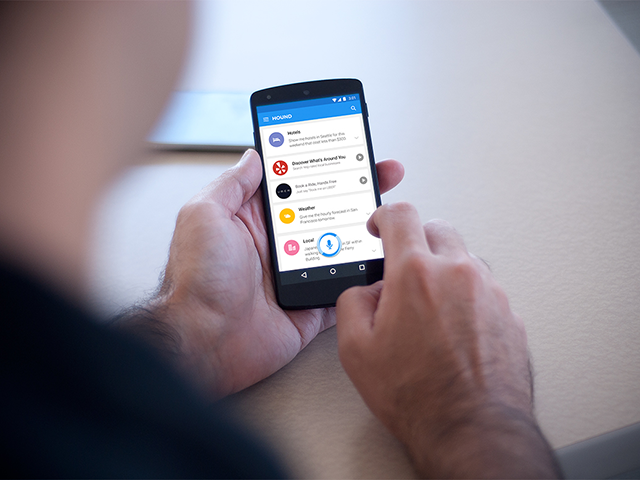 SoundHound has partnered with Yelp and Uber to integrate their data and APIs into Hound. The app’s Yelp integration allows users to receive detailed search results when searching for businesses, while the Uber integration allows users to ask about and order an Uber by speaking their pick-up location and destination. We believe that using voice to interface with devices will become a widespread user behavior if it is fast and delightful. Hound delivers a major step-change to both speed and accuracy, while doing something fundamentally different from previous voice technologies by allowing users to speak naturally and ask follow-up questions to further refine, change or complete their results. Once users no longer feel the pain points of typing on small screens and being misunderstood by older voice services, they will fall in love with Hound. Hound is available to download for free on the iTunes App Store and Google Play.